Born in Antequera in the province of Malaga (Spain), Gomez became a member of the Society of Jesus in 1553. From 1555 he taught liberal arts at the Jesuit Collegio in Coimbra. He was ordained in the summer of 1559. According to a report from the same year, he was esteemed to have been highly intelligent and creative, and exceptionally skilled in the teaching of liberal arts. He started to teach theology in 1564. Gomez’s wish to be sent on a mission to Asia was granted. He left Lisbon in 1571 and reached Macao, passing through Goa. He arrived in Japan in the summer of 1583. Under the order of Valignano, Gomez started to work at the Jesuit Collegio of Funai in the province of Bungo. Indeed it was under the supervision of Gomez that the official course of philosophy began on October 21 of the same year. Two years later, in April 1585, he introduced a program of theological study. Later in 1590 Gomez became vice provincial of the Jesuit mission in Japan. As for his intellectual output, it is important to note that Gomez finished writing his Compendium as the Collegio’s textbook in 1593. This treatise is composed of three parts: 1) On the Sphere (De sphaera) dealing with cosmology, meteorology and matter theory; 2) On the Soul (De anima), heavily based on Aristotle’s work of the same title; and 3) Compendium of the Catholic Truth (Compendium Catholicae veritatis) or On Theology (De theologia) on religious matters. Although Gomez’s Compendium remained in manuscript form (now preserved in the Vatican library), it played a highly significant role in the intellectual history of Japan’s Christian century. 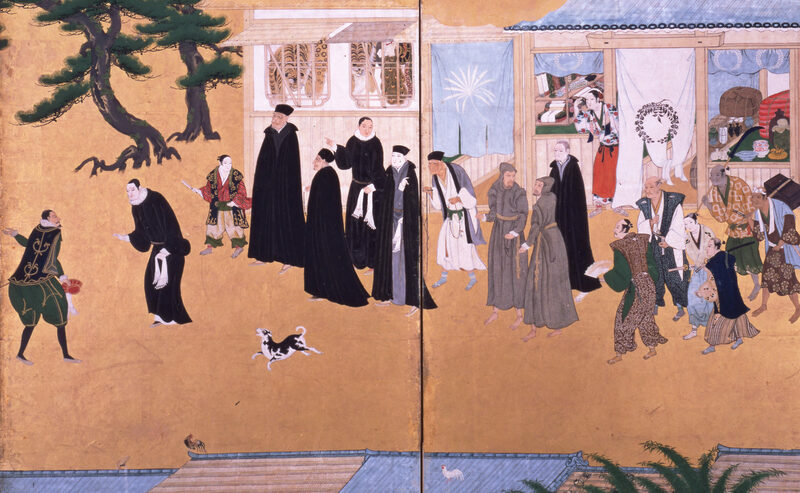 It was indeed the first substantial work that directly introduced Western science and philosophy into Japan. Jeseph Franz Schütte, “Drei Unterrichtsbücher für japanische Jesuitenprediger aus dem XVI. Jahrhundert, ” Archivum historicum Societatis Jesu 8 (1939), 223–256. M. Antoni J. Üçerler, “Jesuit Humanist Education in Sixteenth-Century Japan: The Latin and Japanese MSS of Pedro Gomez’s Compendia on Astronomy, Philosophy and Theology (1593–95),” in Compendium Catholicae veritatis, vol. 3: Commentatries, ed. Kirishitan Bunko Library of Sophia University (Tokyo: Ozorasha, 1997), 11–60. The unique extant Latin manuscript: Vatican Apostlic Library, MS Reg. Lat. 426. Its fascimile reprint is included in: Compendium Catholicae veritatis, ed. Kirishitan Bunko Library of Sophia University (Tokyo: Ozorasha, 1997). The Compendium of the Jesuit Collegio in Japan, ed. Satoru Obara (Tokyo: Kyobunkan, 1997) [in Japanese]. Satoru Obara, “Pedro Gomez’s De spheara (Latin text and its Japanse Translation),” Kirishitan Studies 10 (1965), 179–273 and (1)–(78). Ryuji Hiraoka, “Jesuit Cosmological Textbook in the ‘Christian Century’ Japan: De sphaera of Pedro Gomez (Part 1),” SCIAMVS 6 (2005), 99–175. Satoru Obara, “Scientific Knowledge in Japan’s Christian Century: A Study of Pedro Gomez’s De sphaera,” Kirishitan Studies 10 (1965), 101–178 [in Japanese]. Ryuji Hiraoka, “The Transmission of Western Cosmology to Sixteenth Century Japan,” in History of Mathematical Sciences: Portugal and East Asia III: The Jesuits, the Padroad and the East Asian Science (1552–1773), ed. Luis Saraiva and C. Jami (Singapore: World Scientific, 2008), 81–98. Ryuji Hiraoka, “Clavius and His Astronimical Data during the ‘Christian Century’ in Japan,” Historia scientiarum 18 (2009), 213–236. Ryuji Hiraoka, Early Jesuit Cosmology in Japan, 1549–1817 (Hakata: Hana Publishing, 2013), ch. 2 and 3 [in Japanese based on Hiraoka (2009)]. A modern Japanese translation in Obara (1997). Shinzo Kawamura, The Religious, Social and Intellectual History of the Sengoku Era (Tokyo: Chisen Press, 2011), 87–143 [in Japanese]. No modern editions or translations (except Pt. 1, ch. 68). Jesus Lopez Gay, El catecumenado en la mission del Japon del s. XVI (Rome: Libreria dell’Università Gregoriana, 1966). Masakazu Asami, Idoratory in Japan’s Christian Century (Tokyo: University of Tokyo Press, 2009) [in Japanese].